"I Didn't See Beauty Icons Like Me Growing Up, So I Became One Myself"
Stephanie Villa grew up not seeing anyone who looked like her on TV or in the movies, except for Lucy Liu. Lucy is a fantastic role model, but it's disappointing that more Asian women aren't leading television shows or movies — especially today. Stephanie wanted to be seen as strong and powerful, like Lucy, but had to deal with the ideas others had of Asian women. "There's this assumed stereotype of Asian women in general, that we're very submissive and feminine. And I never felt that growing up, either. I dressed more androgynous. I didn't want to be seen as a gentle flower," Stephanie said. 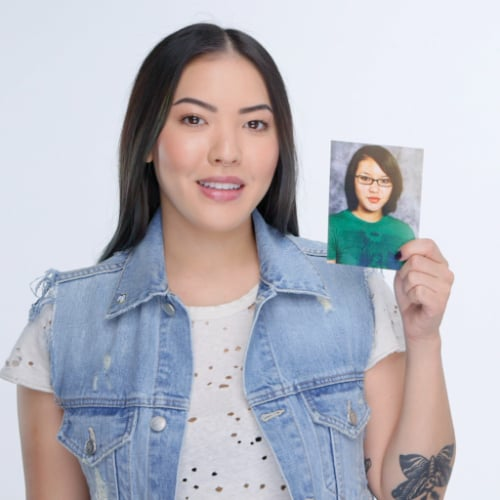 Growing up in California, where there is a large Asian population, Stephanie still dealt with racial slurs like "slits for eyes" from immature classmates. But spending time with her older cousin in the Berkeley area of California helped her to ignore stereotypes and bullies. "He said, 'Eff everybody else! Do what you like.' He would bring me to Amoeba Records and expose me to different types of music and all different types of people," Stephanie said. By being exposed to that culture, Stephanie was able to embrace her own personality and learn to not worry about the opinions of her classmates. Check out Stephanie on Twitter and Instagram , and be sure to let us know how this interview inspired you!